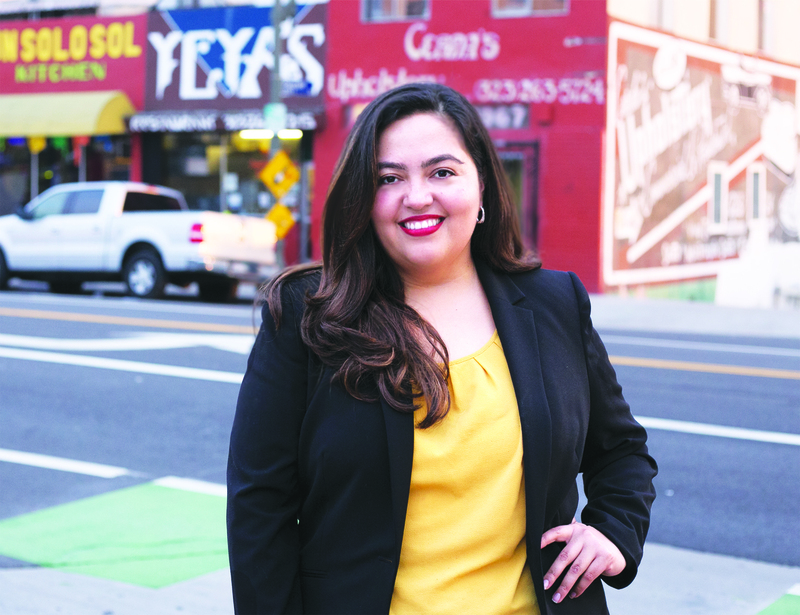 Wendy Carrillo, Candidate for U.S. Congress, was raised in Boyle Heights and City Terrace. It is a sentiment shared by many, especially on the Eastside where there is a widespread and perhaps legitimate perception that the needs and concerns of its working-class and marginally middle-class residents have been historically subordinate to the interests of outsiders. It is was that disconnect that led Wendy Carrillo to pack up her bags, rent a car and make her way from Los Angeles to the Standing Rock Sioux reservation in North Dakota. Made with unwavering conviction in a only a matter of days, her decision to join the tribal water protectors and their allies opposing construction—on Treaty Land—of the Dakota Access Pipeline threatening their way of life, their water, their people and their land typifies Carillo’s approach to the divide between people and their elected local, state and federal governments. Wendy spent two months among the Lakota Sioux, volunteering at a camp site and documenting what she saw for others to see, a critical task in light of limited internet access and a glaring lack of coverage by national media. A vivid episode in the latest chapter of her life story, Wendy’s recent Standing Rock experience does not, of course, fully describe who she is and why she is among several candidates seeking to represent the 34th Congressional District, a seat left vacant by Congress member Xavier Becerra, appointed by Governor Brown to serve as California State Attorney General. To know Wendy Carrillo is to know the story she shares with the increasing number of millennial families now asserting themselves within the emerging narrative of LA’s Eastside and throughout greater Los Angeles, families seeking an opportunity to pursue the vaunted American Dream and contribute, in their own humble ways, to their communities. Wendy’s story begins in El Salvador in the early 1980s when the small yet spectacularly beautiful and bountiful country—rich in history and in cultural traditions bequeathed to its people by highly developed ancient civilizations—was being ravaged by a civil war that claimed the life of her father. Wendy was five years old when her aunt and grandmother brought her to the United States. Her mother, among the thousands displaced by a war in which U.S. strategic, political and economic interests figured heavily, was already in Los Angeles, saving money while working as a housekeeper and a babysitter in order to send for Wendy and her family. Accordingly, Wendy spent the rest of her childhood in City Terrace and Boyle Heights, growing up with four new sisters and a stepfather who adopted her and raised her as one of his own. As was the case for many of us who grew up in the Eastside, staying on the straight and narrow was a challenge, more so for a naturally rebellious Carillo, so much so that she dropped out of Roosevelt High School. Fortunately for her, as soon as then Principal Henry Ronquillo discovered she had quit, he tracked her down, extolled the promise and potential he saw in her, convinced her to return and made sure she graduated on time. “Through his actions, Principal Ronquillo showed me that he cared about me and my future like nobody else had ever done before,” Carillo says about that turning point in her life. Encouraged, Wendy enrolled at East Los Angeles Community College after graduating from Boyle Heights’ Theodore Roosevelt High School, earning her Associate’s degree there before being accepted at Cal State LA, where she graduated with a BA in Communications. 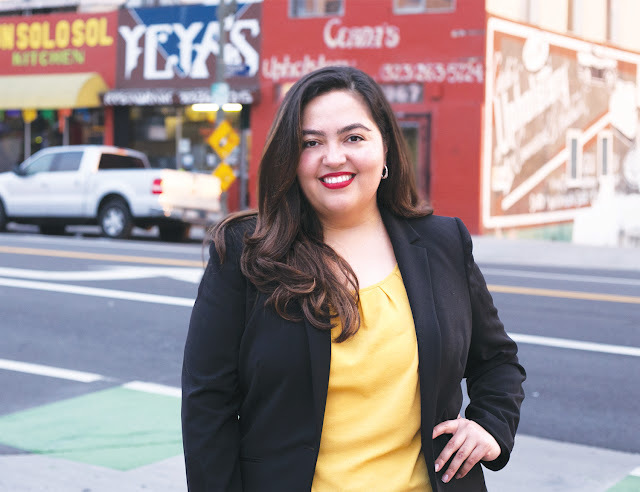 Following that up with graduate studies at USC, Carrillo completed her Master’s in Journalism with an emphasis in Politics. An immigrant, who only a few years earlier had been undocumented, she now represents the fulfillment of that elusive American Dream. It is a narrative we all know well. Wendy wants to be our Congresswoman because she believes the opportunity to fulfill that dream should be a basic human right. In her work as a grass-roots journalist, Carillo blazed a trail in media for 10 years as the producer and host of a weekly radio program that aired on Power 106, a leading Southern California FM station which dominated the ratings among the elusive 18 – 34-year-old demographic for many years with a programming mix heavy on Hip-Hop and bolstered by marketing and promotional efforts aimed primarily at urban Latino youth. Appropriately titled “Knowledge is Power,” her show challenged us to think beyond the status quo on issues affecting our communities, such as the lack of access to quality education, race relations, inequalities within our government and the problems associated with gangs in our neighborhoods. She dared to discuss issues that many in mainstream media and among our own political leadership avoided. In doing so, she provided a platform for engagement when it was most needed. From her work at SEIU on behalf of long-term care workers as a coalition builder in charge of the Union’s communications efforts to her work as a reporter covering national and international news, Wendy has never refrained from broaching the issues that needed to be discussed. Sitting at her kitchen table while drinking coffee from her USC Alumni mug, Wendy goes over a list of family and close friends who she needs to call back. That list has grown exponentially since she announced her intention to run as a candidate in the race to determine Becerra's successor as the elected representative of California’s 34th Congressional District in Washington. While many of those messages were punctuated by surprise, they also included effusive words of encouragement and a stream of offers to help in any way possible. For the middle-class family in Northeast LA struggling to make their mortgage payment. For the student hustling to pay for tuition because of cuts in financial aid. For the day laborers in the Eastside, Mid-City and Koreatown who get on the bus every morning to go to work because retirement is not an option. For the small business owner who opens the doors daily with the hope of generating just enough just to pay her staff. For our undocumented brothers and sisters who fear being relegated to life in the shadows once the new Administration takes office. For our youth who are in sore need of hope for a brighter future… we need a fighter. We need a champion. We need somebody who cares about us, our needs, our concerns, someone who will stand alongside us through all our struggles as a voice and an advocate in Washington, where a new president is, even now, preparing to stage a make-over that doesn’t include us. With Wendy, we matter. By working hard to send Wendy to Washington, we can be assured that Trump’s makeover won’t happen without a fight. Ulisses Sánchez is a Boyle Heights-bred organizer, neighborhood advocate and political consultant. Opinions and endorsements expressed in guest editorials are those of the author alone and do not reflect an endorsement of, support for or agreement with opinions or beliefs expressed therein by Brooklyn & Boyle editorial staff or our publishers. Candidates in the contest to represent U.S. Congressional District 34 are all invited to avail themselves of an open editorial policy which guarantees equal space and coverage of individual campaigns.